The most unlucky little girl in the world. Let's just say you're a little girl. And say you are alone and in danger. And say that the only super hero around to save you...is Ghost Rider. Like, seriously, how terrified would you be if you saw this lunging at you? 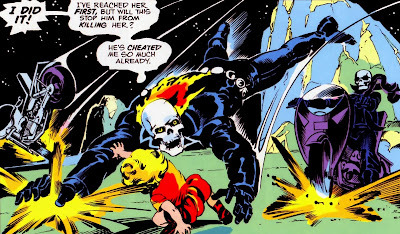 Image taken from Ghost Rider #35 by Jim Starlin, reprinted in Ghost Rider Annual #2, available in fine comic shops everywhere. YOU THINK YOU GOT WHAT IT TAKES? !